In a recent recording published on YouTube entitled Spoon Bending Secrets in the Matrix, spokesman for 'Desteni', a 'Group of People Exploring Equality & Oneness Principles', Bernard Poolman claims all forms of group activity and mass movements run on ectoplasm. He describes ectoplasm as 'a phenomena' that was 'prevalent in the 1950s – big-time'. 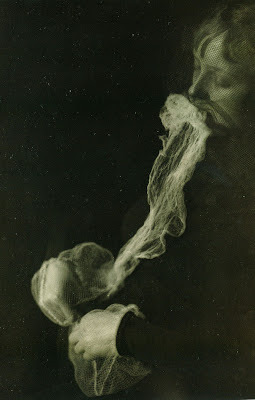 Ectoplasm was not prevalent in the 1950s. The apparent phenomenon began dying out in the 1930s. This is because ectoplasm and so-called 'materialisations', which had never been prevalent but took place in Spiritualist séances of the 19th to early 20th Centuries, were proven by scientific and psychical researchers to be fraudulent, as was Uri Geller's spoon-bending. If, as Poolman suggests, ectoplasm is in every human body and the driving force behind all groups and mass movements we would still be none the wiser. Although he claims no-one understands it, he fails to define what it is and offers no evidence it exists. Ectoplasm was a spectral trail of goo that appeared to issue from the orifices of Spiritualist deep trance mediums. It was said to be the 'life force' connecting them to 'spirit realms' and was faked by use of muslin, paper, egg white and trick photography. 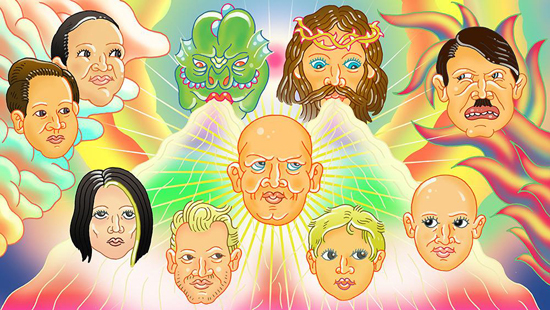 Ectoplasm and spoon-bending are charlatanry, as is 'deep trance mediumship', which is synonymous with 'channeling'. That is, pretending to be a conduit for otherworldly entities, as practised throughout New Age religion and having its roots in 19th Century Theosophy, Spiritualism and prior religions or forms of spirituality. The term, 'channeling' became popular in the 1970s along with the advent of Jane Roberts' 'Seth Speaks' act in which she went on about 'multidimensional reality'. Sunette Spies is supposed to communicate 'interdimensionally' and be able to 'interview' the so-called 'mind consciousness systems' of entities or things. 'Mind consciousness systems' is an invented phrase of Poolman's Desteni. It practically means the same as 'spirits', just as 'dimensions' would be an alternative name for 'spirit realms'. After Spies' videos appeared on the web in 2007 many commentators described them as a prank, evidence of multiple personality disorder, possession by demonic forces, some form of mind control or schizophrenia. The Desteni material states that Spies trained with Poolman for at least two years prior to releasing her videos, originally described as 'channelings' on the Desteni-Universe website in 2007. This was later changed to 'portal messages'. Desteni tried to define Spies as different to a channeler. Their reasons were nonsensical or futile, such as that she never got as tired as easily as a channeler would, spoke for a wider range of entities than any channeler, or had no prior background or training. it also doesn't really matter 'who' comes through the Portal -- if you watch the videos on YouTube you will notice that every being in every video conveys the same message, the same principle -- and so you're really just dealing with 'one voice' coming through the portal. As Poolman said: Understand that the message from Desteni is not really the message from the portal. The portal is a demonstration of what is possible in the physical. The message is actually from me. Bernard Poolman has as yet only ever published audio recordings and a few still photos of himself, but there are thousands of videos of Sunette Spies acting as a 'portal' to his 'mind consciousness system'. Apparently to offset the chance that he might be perceived as some kind of crank, he states that Desteni is 'one of the most sane organizations the world has ever seen'. If this is the case and Poolman's idea about ectoplasm is in fact true and only he really understands it then why is Desteni not a mass movement? equal full of lies still gaining popularity at facebook on brainwash, they have already reach 1.000 people, i start to fear the worst. And those idiots just can't look for they selfs. They look for themselves in Poolman, Spies and being 'destonian'. see no difference to other groups on the first glimpse. Democracy and Capitalism or Communism are all built that way. Im a neutral researcher, and I think you guys are projecting some hate and agression into a group of people that have unusual norms to yours. I´m not sure why you manipualte pictures of people I dont know to look like bad people. When you wanna see "bad" people with bad intentions just go to your local supermarket. There is a freedom of speech and guess what. I just have been used and not paid by my boss at work. You cant start to banter my boss in the system we live to be the evil anti-christ too. maybe you´re right and i need to research more..no idea. the fact you need to approve my posts show that you in fact are narcisstic and want to rule over what me as a neutral guy researching Desteni thinks. The reason comments are published subject to approval is because of spam. All on-topic comments are welcome and will be approved regardless, no matter if they are neutral or biased.